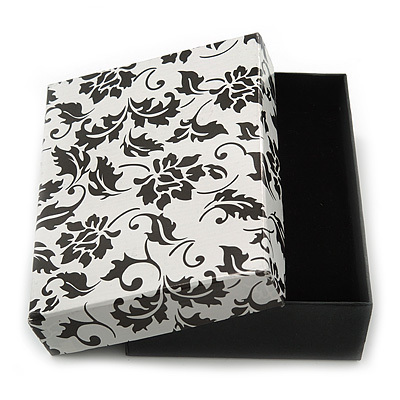 This Black/White Card Gift Box is a perfect compliment for your jewellery. It can comfortably accommodate most of brooches, necklace and pendants. It has 2 slits on the top for a pendant and 2 small wholes for earrings, and 1 slit in the middle for a ring or a brooch. This Black/White Card Gift Box for Brooches, Pendants, Necklaces, Sets or Earrings is a stylish and surprisingly inexpensive way to present your jewellery. You will be surprised by how much you get for such a small price!